Benoit Paradis, in his senior year, earned Sunshine State Conference Men’s Tennis Player of the Week for his success during the week of Mar. 24. This marks the second time Paradis has achieved this honor, with the first during his sophomore year in 2012. His most recent award, however, is a product of going 6-0, winning three doubles and three singles matches against West Chester, Bluefield State and Washburn. One win included a 6-3, 2-6, 7-6(7) victory over 21st-ranked Jacob Carey from Bluefield State. The Mocs went 3-0 during this stretch, and gained some needed momentum heading into April. “He is well deserving of this award. 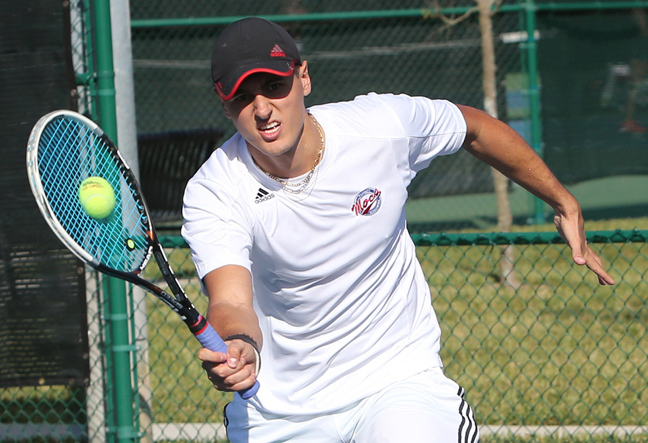 With such a stacked conference he is often overlooked, but his career at FSC speaks for itself,” Head Men’s Tennis Coach Trey Heath said. Paradis was named co-captain in the wake of his junior year due to his leadership on and off the court. He has a reputation for being one of the most mentally resilient players in the country, relying on his serve and speed to get him through matches. He has primarily played at the No. 1 and No. 2 singles spots, consistently facing the nation’s best players. “At this level, everybody is good. What differentiates winners from losers is not talent, but mental toughness. I believe I can beat any player, even ones who are better than me,” Paradis said. His physical fitness is another area that has steadily improved over his career at FSC. Heath alluded to a prominent workout program in the offseason, which helps the team physically peak in spring. But several teammates attested to Paradis putting in extra hours sprinting around the lake, and doing additional sets in the gym. He is also said to inspire others around him to always get better. “He’s a grinder. His fitness drives him to win many matches, especially three-setters,” Fellow Co-Captain Nathan Leavitt said. The 32nd ranked Mocs have no matches left on their regular season schedule, and are currently 10-9, 2-4 in the SSC. In order to qualify for regionals, they will likely have to pull an upset in the first round of the conference tournament, either against St. Leo or Rollins. The team will likely turn to Paradis in efforts to help provide a spark. “I will go to into the conference tournament with a mindset to win. Also, it is important for me to enjoy the moment since it’s the last time I will get to participate in the tournament,” Paradis said. Paradis is currently 9-10 in singles play and 10-9 in doubles with his partner, Emanuel Lueber. They have played together for the last two seasons, and have two wins against other nationally ranked doubles teams in 2014. They will take the court next for the SSC Tournament at Winter park on April 24. It may be the last match of an impressive college career, but barring an upset, perhaps not.